If you are looking for inspiration for your new hairstyle, look no further. 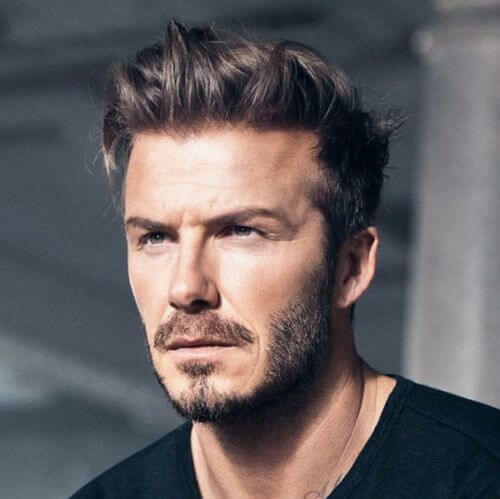 Take a glance at the David Beckham hair inspiration look book. 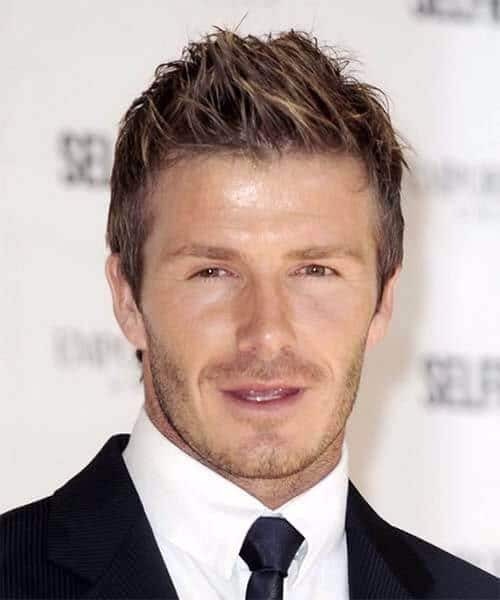 This celebrity footballer, superstar, and English royalty as far as his fans are concerned has really sported all the haircuts known to man. Apart from that, the most incredible thing is that he managed to look astonishingly gorgeous in all of them. To showcase this point, we’ve decided to put together a list made up of 50 of his most treasured looks and haircuts over the years. 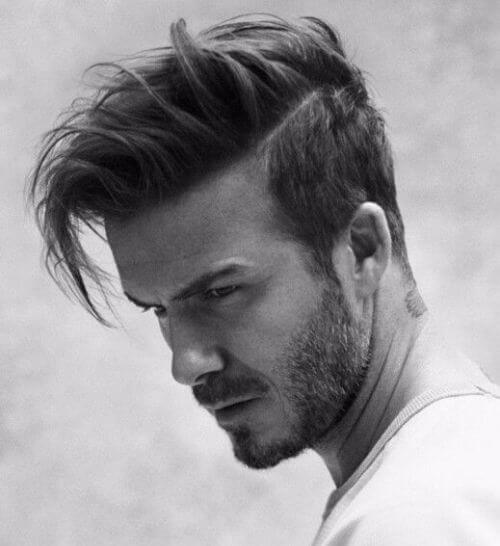 Here are the David Beckham hair ideas which will inspire you for your next cut. 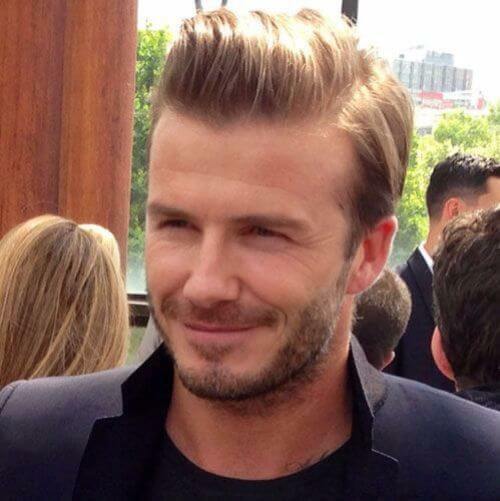 Here is a picture of Becks from 2012 where you can see his stylish cut in all its glory. His hair is parted on the side creating a big quiff in the front and at the top. The back is just as glorious, being partially undercut into perfection. No, he’s not in his fifties, but he can surely rock a fifties haircut like the King himself. Notice how the sides are shaved off, leaving the bulk of his hair on the crown of the head. This little trick elongates his face and makes his cheekbones stand out. Here you can see the front of his undercut hairstyle. He has a bit of hair product in his mane to keep those gorgeous locks into place. 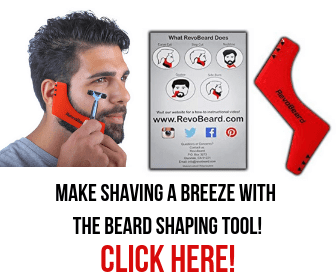 At the same time, the product ensures the perfect high quiff. 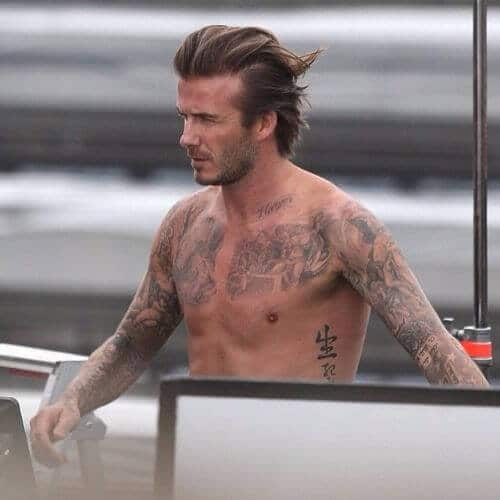 Our dear Becks really is an inspiration when it comes to hair. This is the exact same haircut as above, only styled in a different way so that it seems completely new. Use some hair gel to slick back your hair and copy the look. 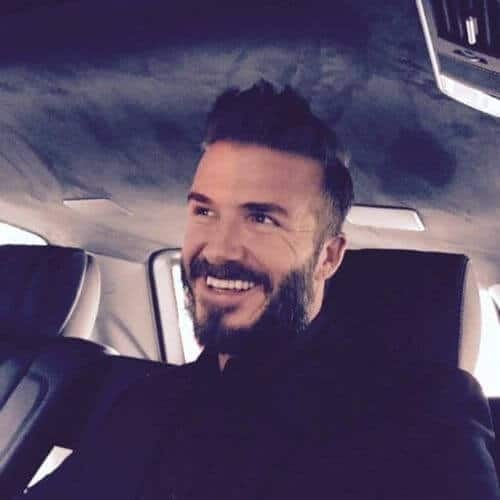 Now that he’s retired and doesn’t have to keep his hair out of his face, Mr. Beckham can afford to let it grow a bit and run wild. Here he is in a dashing stance with a shaved side and a very long and messy top. David has also sported the so-called Ivy League haircuts from time to time. This David Beckham hair idea is a college boy cut gone wild. Add a denim jacket and a few tattoos to get the look. 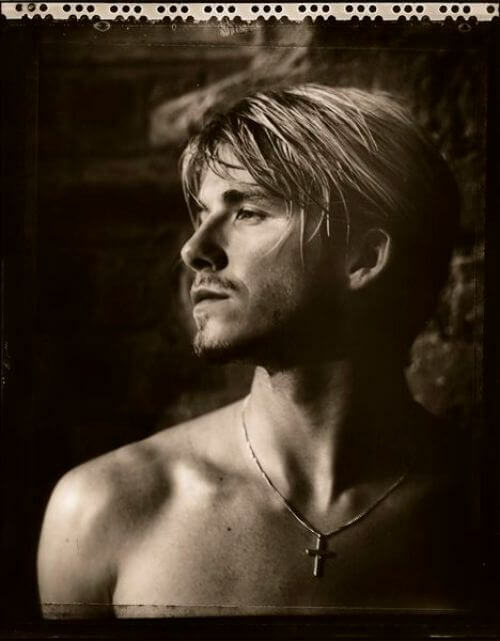 It just so seems that nothing can go wrong when it comes to the David Beckham hair concept. Here he is smiling dashingly. His head is shaved on the sides, and his long top is fashioned into large spikes. If you are considering borrowing this look, you will also need a beard. If not, at least an unshaven aspect, for that extra ruggedness. Don’t overwork your hair. Let it develop naturally and sit of its own accord. 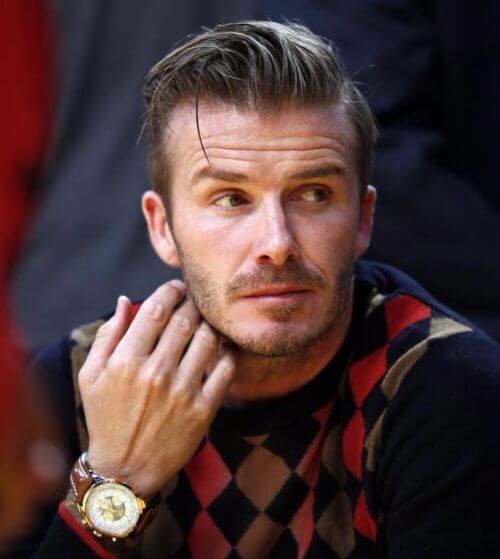 David Beckham is cool when it comes to hair. In fact, he’s so cool that he even attempted to pull off a James Dean, with the comb over and the leather shirt. Evidently, he succeeded all the way. Here is Becks in one of his matches for the LA Galaxy soccer team. He was sporting the same haircut back then as well. It’s a long top with shaved sides. However, it was a bit demurer, seeing as he was hard at work concentrating on those famous free kicks. This is one of the longer hairstyles that Dave tried out at some point. Consequently, you can go for it as well. It’s a very clean look, the superstar having parted his long hair sideways and had grown hardly any beard at all. Here he is wearing mostly the same David Beckham hair as above, only in a more ‘dad next door’ kind of way. His hair is longer, only a lot more natural and with a lot less product in it. Apart from that, his beard is somewhat longer. Never has one looked as poised and polished as Becks looked for this occasion. His hair has been whipped into submission using copious amounts of product and a perfect side parting. The beard and pale grey suit help a lot as well. 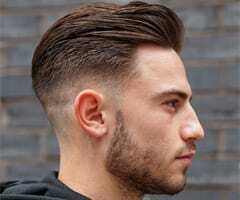 To copy this look, you can ask your barber to shave the sides and back of your head and leave a messy long top. Or you can show him this photo. Either way, you will have to comb and style it every day to be able to look like this. Dave has also famously sported a crew cut too. This is a type of military haircut which has seeped into the mainstream. As a consequence, a lot of civilians now sport it as well, Beckham being just one of them. 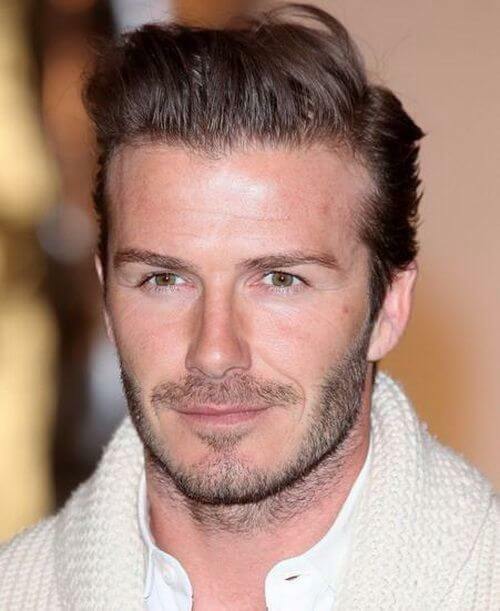 David Beckham has proved to have both these qualities throughout his career and this haircut helped him a lot. It’s yet another short military cut, with spikes on top and a beard. Use some mousse to keep your hair up. Here is an iconic look for the superstar football player, one which he sported for many years. It’s a simple yet effective buzz cut, which he teamed up with a stubble, bushy eyebrows, and a diamond earring. The older he got, the more elegant he became. He dropped the idea of dyeing his hair blonde and went for a more natural and artistic look. Dressed all in black, with a gold bracelet and his signature sleeve tattoos, David is the embodiment of perfection in this pic. David had a great idea for this particular look. He combined a very formal outfit with a messy hairdo. The elegance of the look is balanced perfectly by the gelled spikes he has on top of his head, making him look formal yet approachable and young. 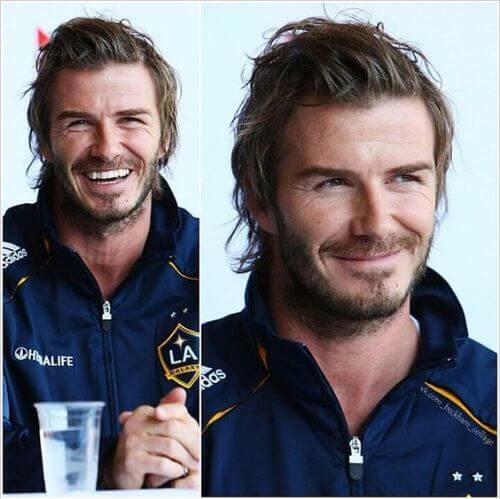 We all know that David Beckham is one of the most handsome men on the planet. Consequently, this picture goes to show just that. Here he is at a photo shoot, sporting a stylized short side and very long top haircut. We have now come to the famous cornrows incident. 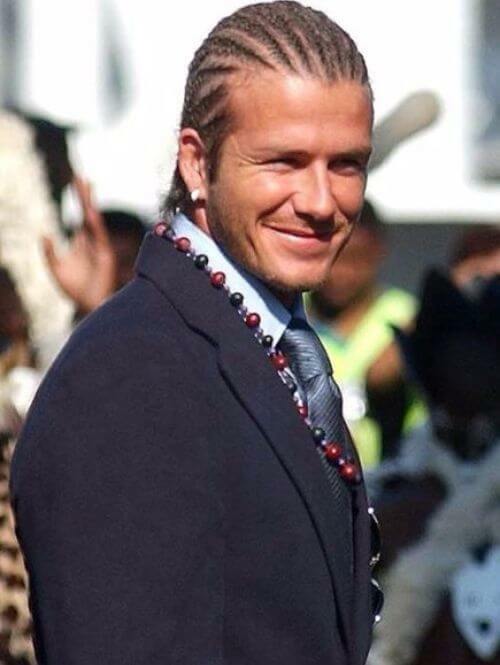 Beckham sported it as well some years back. Critics didn’t think much of this braided hairstyle combined with studded earrings. However, we believe he actually made it work and so can you. One of his best look ever as far as David Beckham hair is concerned was the Mohawk. He looked incredibly fierce and like a force to be reckoned with in it. Here he is sporting a faux Mohawk, with a spiky front. Continuing the countdown of all the Mohawk styles he went for, here is the half shaved one. He also has a bit of a Machiavelli moustache and goatee going on, as well as a stubble. The result is very manly. 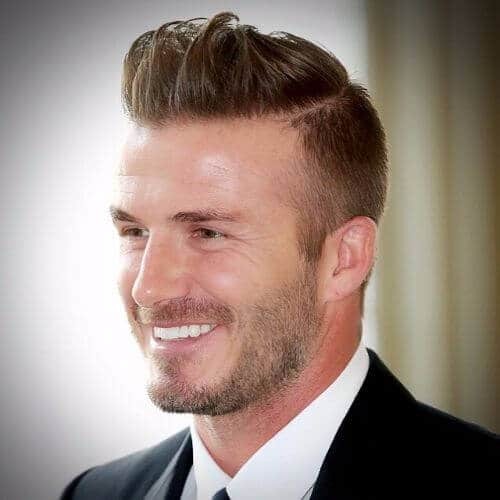 It’s very easy to talk about the David Beckham hair choices because he’s had so many that we forget the number. However, none quite like the undercut with the sleek top. He has the perfect face for it too, seeing as it’s slim and angular. If you ever wondered why he was chosen to advertise so many products, here is your answer. Becks looks amazing even in his time off. The natural swept back hair, hipster glasses, designer watch, and sleeve tattoos make him look like he’s ready to step onto the catwalk at a moment’s notice. Dave was a heartthrob right from his early years when he used to play for Manchester United back in England. He used to sport sandy blonde hair, parted down the middle, with long bangs and a messy updo. Gel was a very important part of his life when he was young. 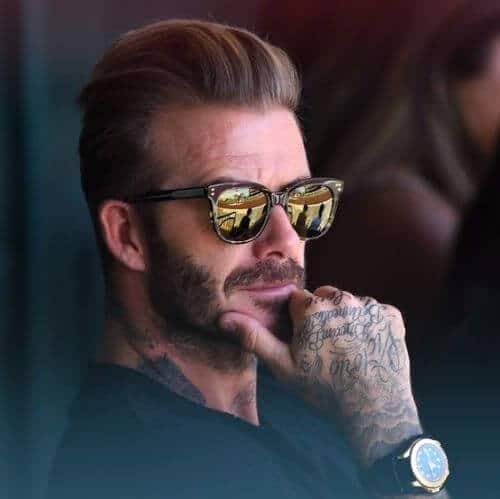 If you decide to go for the David Beckham hair, you can look like a superstar as well. Take very good of your hair though, especially if you have fine to medium hair, just like David does. Use only the best hair care products and comb it every day. 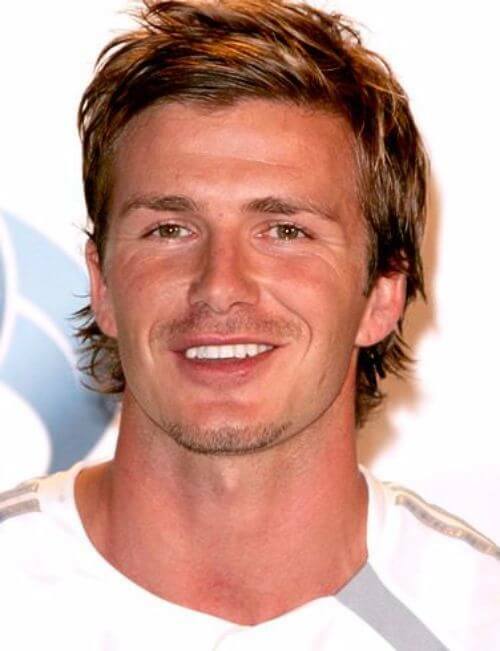 Here is the David Beckham hair which he sported when he went to play for Real Madrid in Spain. 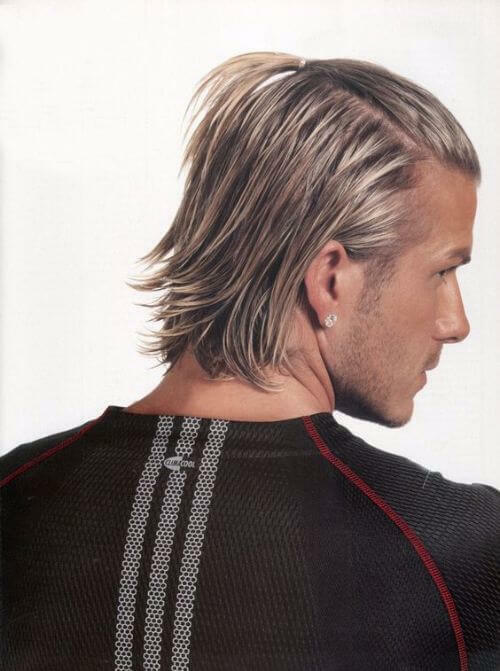 During the Galacticos era, David’s hair was dirty blonde, and cut down to a bob. To be able to play unencumbered by his hair, he used to tie it up in a small fishtail braid. Nowadays, he has returned to more natural hair colors. This is him in a chestnut colored hue which highlights his hazel eyes perfectly. It’s also a great color for the cold season, if you decide to go for it. David simply loves to flaunt his hair along his gorgeous smile. No matter how short his hair is, he still finds a way to add a touch of flamboyancy to it. Consequently, this is exactly what he did for this occasion. 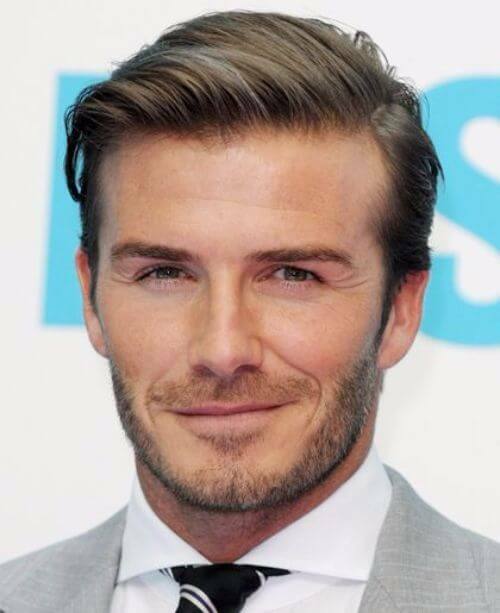 We have already established that the David Beckham hair is a thing of perfection. And this look is just one more argument in favor of that idea. 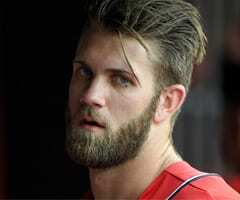 The oversized spikes on top paired with the long and bushy beard make him almost too hot to handle. Dave also loves a good casual cut, when it comes to his hair. And if he has the chance to flaunt it while riding a bike with the wind in his luscious locks, even better. Copy the look by growing your hair and swiping it to one side. With a red poppy pin to celebrate Remembrance Day, David looked demure and stylish during this interview. 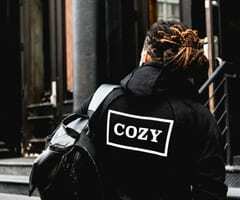 His long hair was swept back into a flat top. In fact, it is one of the rare moments when you get to see him sport this cut. Here he is in another version of a haircut he simply seems to adore – the undercut. The sides and back of his head are shaved, while the top is long and slicked back. Therefore, it almost looks like he has another one of his famous mohawks. 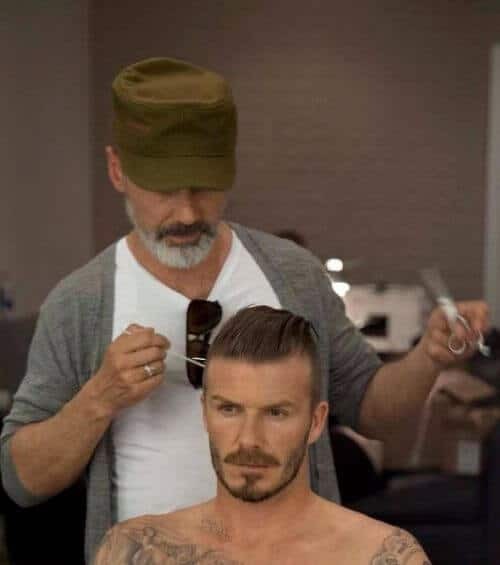 David loves his military cuts very much as well. And he has a good reason to do so too. He simply looks stunning with almost all his hair shaved off. The main reason is that he has an amazing facial bone structure that doesn’t need a fancy haircut to look good. If he had been an actor, David would have probably made a very good James Bond. This still from a photoshoot is here to prove just that. The mysterious attitude is completed by a classic haircut, a crisp white shirt, and a loose bow tie. Dave loves his side parts. And why shouldn’t he when he looks so good donning one? In this version of the side part, he also has a trace of sideburns as well as a glorious stubble which gives him a rugged look. 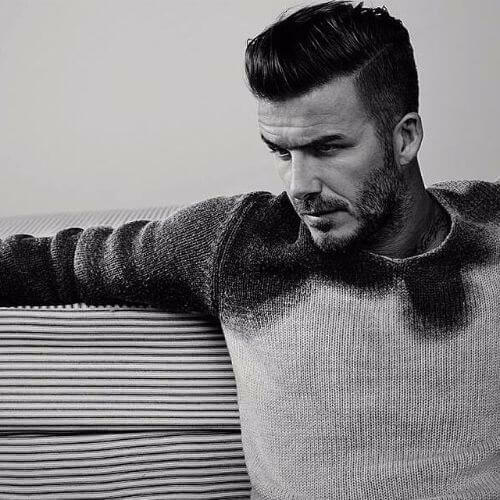 When we say minimal, we mean as far as the David Beckham hair is concerned. The rest is as flamboyant a look as they come. His white shirt is open almost down to his belly button and he has strings of beads around his neck. To copy the look, add some diamond studs and one of the Spice Girls. Becks might not have wanted the Clark Kent image here, but this is what he got. 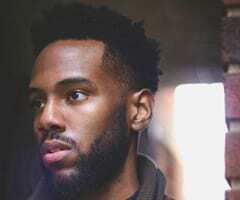 The classical cut with almost shaved sides and very long top, as well as the strand of hair which falls carelessly on his forehead reminds us of the Kryptonian vigilante. Going closer to his natural hair color, Dave sports this beautiful brunette shade with an Elvis Presley top. Even his shirt is all about the fifties in this pic. The tattoos are a breath of fresh air and modernism which reminds us that it is, in fact, 2016. 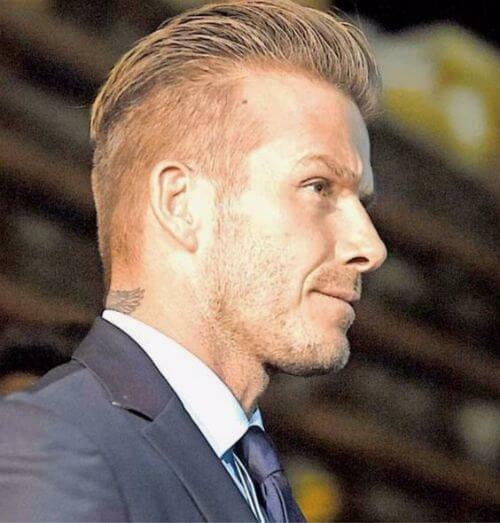 Leave it to Becks to find yet more versions of the simple comb back. For this one, he parted back only a large strand of hair on top of his head. The rest of the hair was combed down to perfection on each side. The leather jacket and bag as well as the metallic watch make him look like an aviator ready to take off. Switching back and forth between color, the David Beckham hair seems to have a mind of its own. Here it is in a very casual sandy blonde color, swept back carelessly with David himself dressed in a white linen t-shirt and comfortable bleu marine shorts. Why stop at the front and top of your head when you can have spikes all over? Nothing has ever kept David Beckham from sporting his beloved spikes and you should follow his example. He went for the flat top before, but not with shaved sides. 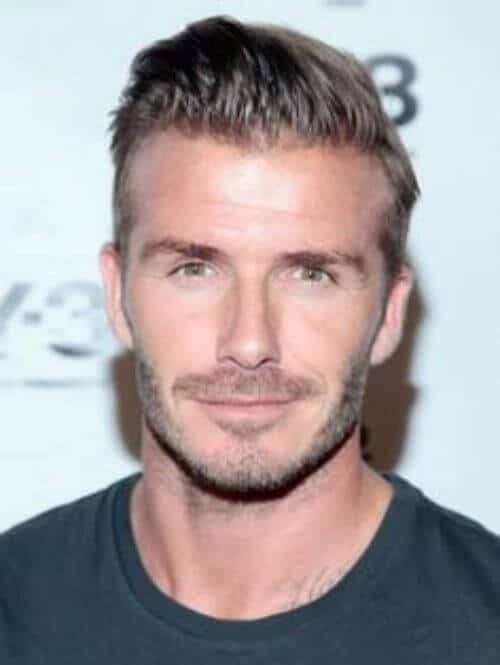 Moreover, seeing as he is the David Beckham and that this is the David Beckham hair we are talking about, he also threw in the mix a ‘three mousquetaires’ moustache and goatee. Well done, Mr. Beckham! 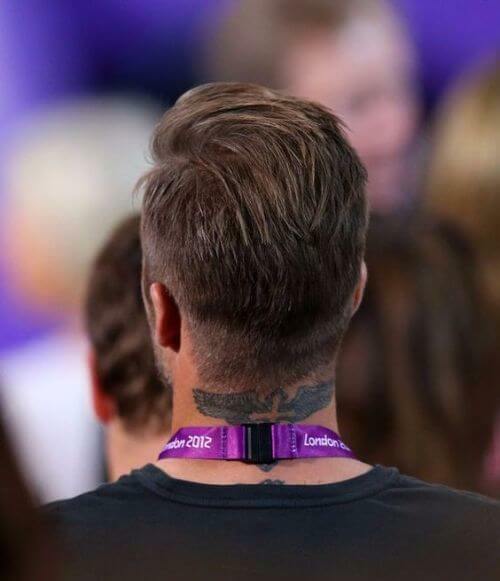 You know you are masculine enough when you can wear a huge tattoo on your neck that says Pretty Lady with a large rose on top of that. 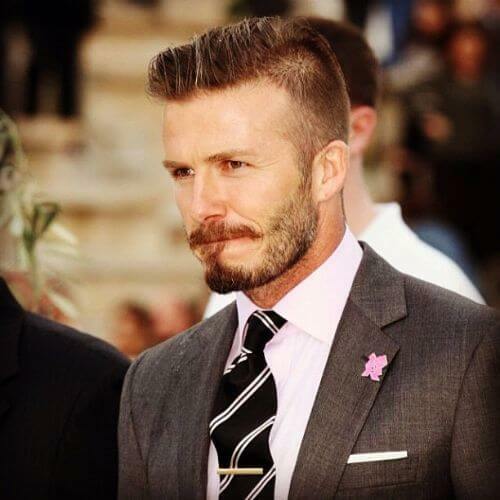 And Becks is all man in this gorgeous natural transitioning hairstyles and hipster glasses. Mr. Becks is giving us a more modern take on the vintage Ice Man flat top haircut from the motion picture Top Gun. 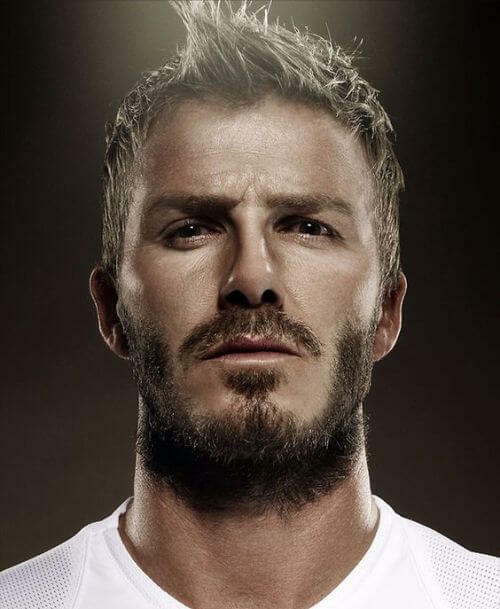 While Ice Man is not a bad example to follow, Mr. Beckham makes this haircut completely his own in this pic. 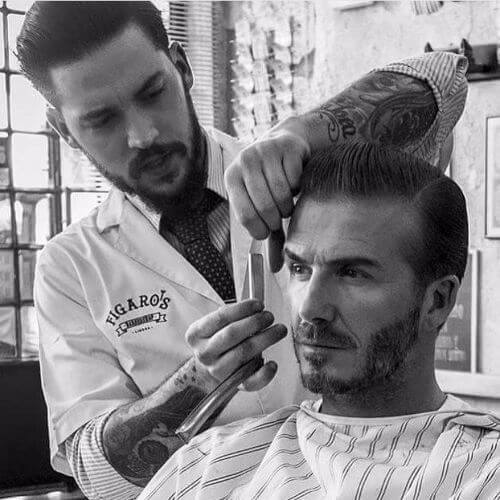 This lovely black and white photo of Becks at the barber’s shows us his perfect locks. All of his hair has been combed through, and you can see the marks of the comb. 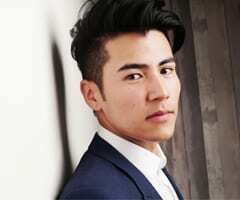 He also has a beautiful straight side parting as well as the beginning of a Pompadour in the front. Not only did he play with haircuts his entire life, but he also loved to mess around with colors. However, this shade of caramel blonde is absolutely adorable and it matches his beard perfectly. 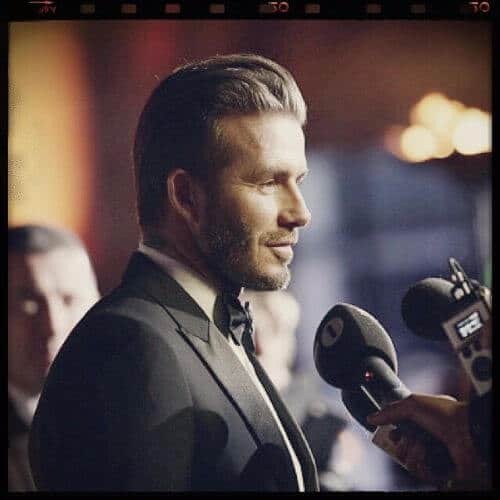 Here is David sporting a Brad Pitt look-alike hairdo for a red carpet special event. The suit and bow tie make him look like a true Officer of the British Empire. Evidently, he owns that title in real life. 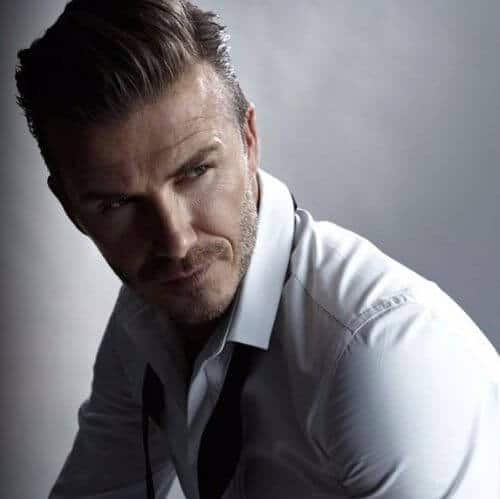 In case the David Beckham hair is your inspiration and you want to blow off some steam as well, take another cue from the superstar and this amazing do. Lay off the hair products for a while so that your hair can regenerate on its own. In the end, it will look better than it ever has!